Description: President Bill Clinton gives us his views on the challenges facing the United States today and why government matters-presenting his ideas on restoring economic growth, job creation, financial responsibility, resolving the mortgage crisis, and pursuing a strategy to get us "back in the future business." He explains how we got into the current economic crisis, and offers specific recommendations on how we can put people back to work, increase bank lending and corporate investment, double our exports, restore our manufacturing base, and create new businesses. He supports President Obama's emphasis on green technology, saying that changing the way we produce and consume energy is the strategy most likely to spark a fast-growing economy while enhancing our national security. 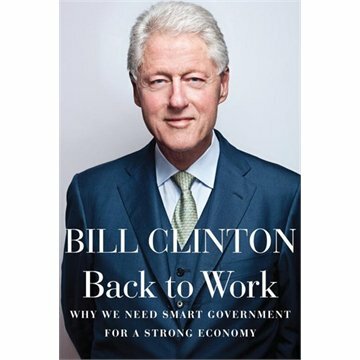 Clinton also stresses that we need a strong private sector and a smart government working together to restore prosperity and progress, demonstrating that whenever we've given in to the temptation to blame government for all our problems, we've lost our ability to produce sustained economic growth and shared prosperity. Clinton writes, "There is simply no evidence that we can succeed in the twenty-first century with an antigovernment strategy," based on "a philosophy grounded in 'you're on your own' rather than 'we're all in this together.' " He believes that conflict between government and the private sector has proved to be good politics but has produced bad policies, giving us a weak economy with not enough jobs, growing income inequality and poverty, and a decline in our competitive position. In the real world, cooperation works much better than conflict, and "Americans need victories in real life." I was oddly enough, thinking about this signing the other day. I'm really sad that I didn't end up going.